Point of Success manages every order from the moment it is opened until it is paid. Helping to improve the operation of a restaurant is one of the most important reasons to buy a point of sale system! Use the ticket list to see every open order in the system, see only one server’s orders, view future orders, or to get more information on a closed order. Instantly view key information on the ticket list, then touch one of the buttons at the bottom of the window to perform that function. 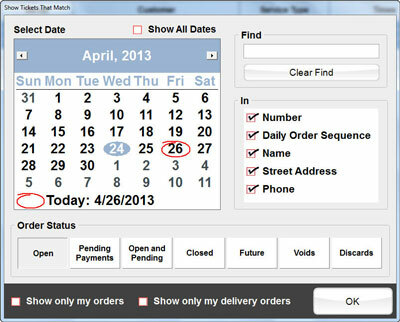 Display one day’s orders, all orders, open orders, future orders, closed orders, and find orders by customer name, address, phone number and more. Easily accommodate large orders, catering orders, or future deliveries. The Future Order Monitor checks future orders twice each minute, waiting for the proper time to notify the kitchen to begin preparation of the order Premium Feature . Future orders work with kitchen printers and the Point of Success kitchen monitor. 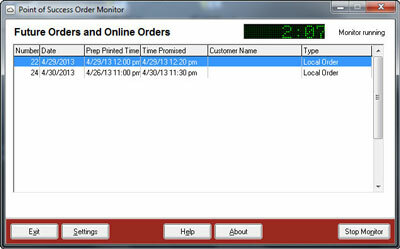 The Order Monitor constantly monitors orders requested for future preparation and online orders, waiting for a designated time to notify the kitchen staff to begin preparation. This software is included as part of the future order feature Premium Feature . 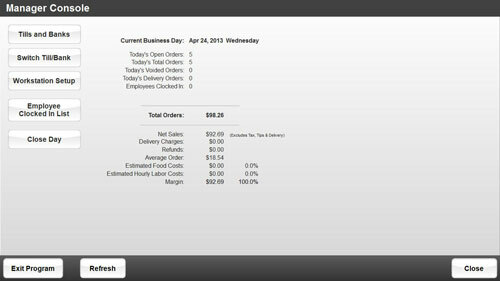 See real-time business statistics including order statistics, employees clocked in, and food and labor cost information.